Inflation is vicious to fiat money users. Figure 1: Fiat money are paid to government employees. All citizens have to pay their taxes with that fiat money. Inflation is vicious to the citizens who have to accept fiat currency from their ruling government. It is half terrible as having to use money with some use-by dates. Only governments like inflation. It is convenient to begin the discussion with my previous posting entitled Your Fiat Money, part 2 (reference ). It is easily seen that the government can choose to pay its employees X units of its fiat currency C1 and require the whole population to pay it all taxes amounting to X units of that currency. The fiat money C1 will find its own value in the population depending on how government employees interact with the whole population of the country. Alternatively, the government can choose to pay its employees Y units of another fiat currency C2 and require the whole population to pay it all taxes amounting to Y units of currency C2. Again the fiat money will find its own value in the population. and the value of a fiat currency is inversely proportional to the amount issued by the government to its employees. Consequently, if all other things are unchanged but the government increases both the payment to its employees and the tax to be collected by 3% every year then its currency is worth only 100/(100+3) its former value one year ago. This is called an inflation at a rate of 3% per year. 2. Inflation is a rent on fiat money. After selling his stock, a trader has cash (which is fiat money), he will have to use his cash to buy new stock. If he holds on with the cash for one year, he can buy only (100-3)% of what he could have bought immediately. This works as if he was renting the cash from the government at a cost of 3% a year. The long standing wisdom is not renting anything you don’t really need and people should not keep cash longer than it is absolute necessery. 3. High inflation may feed on itself. Remember that the fiat money will find its own value in the population depending on how government employees interact with the whole population of the country. When high inflation occurs people may try to increases prices in anticipation, causing even more severe inflation. People may then even try to avoid using any fiat money at all and they may choose their own alternative bartering medium such as food (rice grains or flour) or commodities (gold or silver) instead of the readily available but steadily depreciating fiat money. (see [4,5,6,7] for bartering techniques). Such avoidance of fiat money brings even more loss of its value and deepens the inflation. When inflation is too high, the ruling government may lose its grips on the economy and chaos may follow (as in Germany prior to 1933). 4. High inflation reduces actual interests on government debentures/treasury bonds. Inflation is to be subtracted from the interest rate given by any government debenture/treasury bond. The inflation rate is hard to obtain but it must be taken into account when buying government debentures. Unless the after tax return from a government debenture/treasury bond is higher than inflation, the bond holders may actually LOSE money on their bonds. The interest rate given on Government Debenture/Treasury Bond is determined at the time of sale while actual inflation is made after that time. A government can easily wipe out its debts to bond holders by producing very high inflation. (see ). 5. Inflation rips off members of pension plans. The loss caused by inflation on cash based holdings (rents on cash) also applies to long term storage of values such as saving for retirements. Unless inflation has been taken into account, most perceived benefits of pension plans can be only just mirages given to uninformed plan members. To have any real benefit after tax and INFLATION, plan members usually need cash contributions/injections by the government and if they don’t obtain them there will arise the problem of unfunded liabilities. In most cases, the contributed funds of any pension plan cannot earn any net income AFTER tax and INFLATION. If there is no cash contribution/injection by government, plan members would be MUCH better off using their contributions to buy gold and save the gold for their own retirements. Figure: Vietnamese standardized gold slabs for trading. The imminent run (insolvency) of pension plans are only the tip of the iceberg. (see reference ). 6. Inflation produces a stealthy wealth tax. Inflation actually produces stealthy, disguised taxes on your properties. When you change your house, as you have to move to a new location for new jobs, the value of that succession of similar houses keep on increasing due to inflation. Governments can classify the increases as “incomes” and impose taxes on them. Some governments have already done that. This type of FALSE incomes may also be extended to include your other possessions such as cars, jewelleries, housegold goods and gold holding. These taxes on FALSE incomes are actually taxes on your possessions such as your houses and the tax rate depends on inflation. Your legislative representatives will not bother to make yearly oversight of it and the governments easily get away with it. The federal authority may have encroached on the rights of member states if it makes property taxes! So the federal authority has to do it under the guise of income tax on false incomes produced by inflation. Only recently, the US State of Arizona admitted that gain/loss made from gold holding is not subjected to Income Tax of that State. 7. Inflation causes non-synchronized price increases. Inflation causes uneven, non-synchronized price increases due to different flow on times for different types of goods. This allows the government to put unfair short term weighting factors on individual types of consumer goods. The weighting factors let the government artificially select them to manipulate the yearly statistics on the Cost of living to lessen its obligation to pay pensioners their entitled upkeep. 8. Inflation forces people to borrow. Inflation forces people to borrow with any purchase plan stretching over many years. A buyer would lose to inflation on his cash accumulation/saving if he wants to remain debt free and save up the whole amount for the purchase. House purchases are typical examples where buyers are forced to borrow. 9. Inflation gives government unfair advantages in charging taxes on citizens. 10. All governments love inflation. 1. Inflation is a rent on its fiat money. 2. It can define False incomes and tax its citizens on the false incomes. 3. It can muddle statistics on Cost of living and the government can fool the world with its manipulated figures on the growths in GDP, GNI. 4. It allows government to gain unfair advantages over its tax payers when calculating their taxable incomes.
. Your fiat money (Part 2), posted January 12, 2017.
. Your fiat money, posted January 9, 2017.
. Why does the Federal Reserve aim for 2 percent inflation over time?, Board of Governors of the Federal Reserve System,https://www.federalreserve.gov/faqs/economy_14400.htm, updated January 26, 2015, accessed 03 Mar 2017.
. Neha Sharma and Shalu Yadav, The Indian village that has returned to bartering, BBC News Services,http://www.bbc.com/news/world-asia-india-38180075, 5 December 2016.
. Patrick Bodenham, Will Spain’s coal belt survive through online barter?, BBC News Services,http://www.bbc.com/news/world-europe-38731808, 2 February 2017.
. James Melik, Haggling and bartering gain appeal, BBC News Services,http://news.bbc.co.uk/2/hi/business/7883050.stm, 12 February 2009.
. Mark Lowen, Greece bartering system popular in Volos, BBC News Services,http://www.bbc.com/news/world-europe-17680904, 12 April 2012.
. Joseph Goebbels quotes, azquotes.com, http://www.azquotes.com/author/5626-Joseph_Goebbels.
. https://www.moneymetals.com/news/2017/05/04/higher-inflation-consumer-prices-001061, (added on 10 May 2017). A satirical guide to signs of an impending crash for small investors, Your fiat money (Part 2), Your fiat money, Bankers given outrageous incomes by their boards, Signs pointing to an impending crash for small investors,Bankers earn more than interest margin on secured loans, Can most pension funds last? Air-grown mung bean sprouts for food. The benefit of growing sprouts in ONLY AIR is that there is no substrate to be contaminated after all sprouts have been collected and there is no substrate waste with horrible rotting smell. It also allows the consumption of mung beans as food without cooking. It requires only drinkable water but uses no fuel. 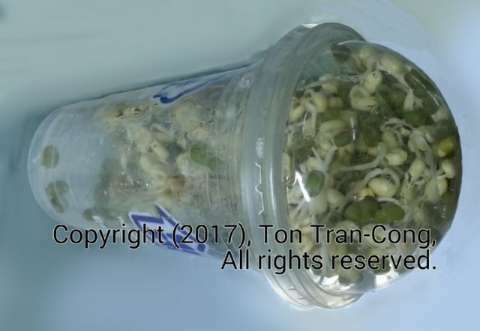 Growing sprouts in ONLY AIR is also suitable for preparing bean sprouts when sheltering in bunkers after nuclear disaster (to avoid consuming hot released, fast decaying radioactive alkaline Cesium and alkaline earth Strontium nuclei). 1. Growing beans into sprouts. When beans grow into sprouts, they convert the highly compact stored energy and materials into small plants to continue the propagation of their genes. The beans need a triggering signal before it enter into this process. In nature, a wrong starting time may mean extinction for the beans. The triggering happens in nature with beans falling into flood water or very wet soggy ground at the end of a rainy the season. After that the sprouts need drier soil to breath and grow. The sprouts will try to grab a substrate with their hairy roots and will grow vertically. It is easier for human to consume sprouts than to consume the highly compact mung beans. This is the reason for growing sprouts from beans for consumption. An additional benefit of eating sprouts from stored beans is the sprouts have plenty of Calcium and Potassium, which can supply the requirements of our bodies if we have to wait in nuclear shelters for the short term radioactive Cesium and Strontium nuclei to decay in the outside environment after a nuclear disaster. Mung beans are thus useful grains for short term food after nuclear disasters. 1a. 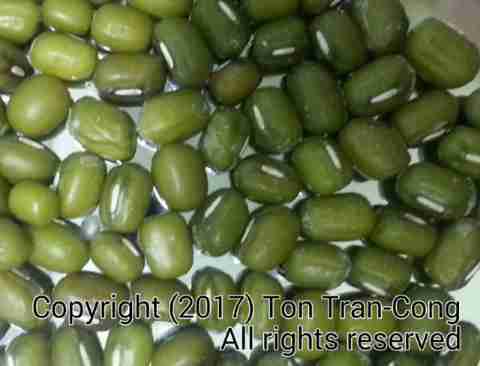 Mung beans (uncooked and in good condition). Figure: Good mung beans for making sprouts. 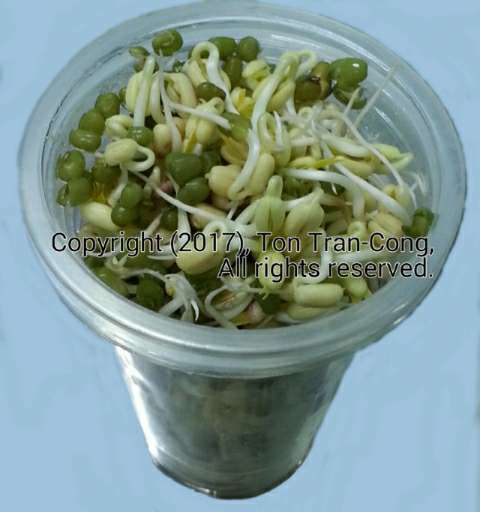 Remember that mung beans will increase in volume and in weight when they become sprouts and only a very small initial volume of beans will grow into a cupful of sprouts. 1b. Two identical clear plastic drink cups with their corresponding hemispherical dome lids. 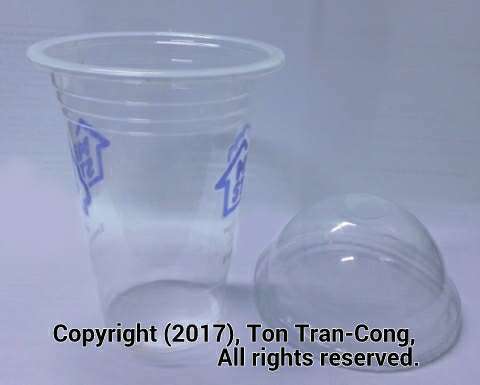 Figure: A clear plastic cup with hemispherical dome lid for growing sprouts. 3. Making the container for growing mung beans. Make about 10 perforation holes on the bottom of one cup, enlarge them so that a fully filled cup of water can drip out of these holes in less than 10 seconds. The second cup is to be fitted onto the outside of the first cup to control the flow of water through the perforations. To stop water from leaving the inner cup the second cup is slipped tightly on its outside. To drain water from the inside cup, the outside cup gradually loosened to let water drip into it from the inner cup, the outside cup is then emptied. Place 3 layers of beans on the bottom of the inner cup. Fill water until water surface is 1cm higher than the top layer of beans. Fit the hemispherical lid on the cup (optional, to prevent spilling if the cup is knocked from its position). The cup is left standing like that for about 12 hours to soak the beans until they germinate with a 2mm sprout on most of the beans. 5. Growing sprouts from germinating beans. Fill the inner cup with water to full capacity. The beans and sprout should be able to move freely in this water. Loosen the outer cup to gradually and completely drain water from the inner cup. Empty the outside cup and slip it back onto the inner cup. Lay the cup on a horizontal surface, with the rim resting about 10mm higher than the bottom. Let the cup rest like that for 12 hour then repeat all the above steps of this section. Sprouts can be seen growing bigger in each 12 hour period. Figure: A horizontal cup is almost full of sprouts after 30 hours (Top view of horizontal cup.). The cup is double layered, it is made up from a perforated one and another non-perforated one fitting tightly outside it. Figure: Air-grown bean sprouts are ready for consumption after 30 hours. The double layered cup is standing upright without its lid. After 30 hours, the horizontal cup is about 3/4-full with sprouts. It should be hold upright and filled with water for well grown sprouts to float to the top for the first harvesting. (Grown sprouts have lower specific gravity than beans and newly grown sprouts). The cup containing unharvested beans and sprouts is then put through all steps of section 5 twice for another 24 hours. After that the horizontal cup is about 3/4-full with sprouts. It should be hold upright and filled with water for well grown sprouts to float to the top for the second harvesting. The cup containing unharvested beans and sprouts is then put through all steps of section 5 twice for another 24 hours. After that the horizontal cup is about 3/4-full with sprouts. It should be hold upright and filled with water for well grown sprouts to float to the top for the third and also final harvesting. All beans will grow into sprouts if the container have been effectively drained and tumbled (not rolled). Without tumbling, some beans may stick to the side of the cup and may remain under water for too long and may rot, creating horrible smell. Rolling is not effective in preventing rot of beans.
. tonytran2015, Mung Beans as grains for self-reliance, survivaltricks, https://survivaltricks.wordpress.com/2017/02/09/mung-beans-as-grains-for-self-reliance/, February 9, 2017.
. Mung bean, wikipedia, https://en.wikipedia.org/wiki/Mung_bean, accessed Mar 06, 2017. Mung Beans as grains for self-reliance. Navigating with an AM MW radio receiver, posted January 17, 2017, The Scorpius constellation, posted January 8, 2017, The Orion constellation., posted December 26, 2016, Rice as emergency food., Using GPS in off-grid situations, Slide Sky-Disks with grid masks showing azimuths and altitudes, Slide Sky-Map for displaying tropical stars. Air-grown mung bean sprouts for food (problem w indexing). This little used blog is now used as my testing ground for my newly designed features. QE may be just another scam to steal national wealth. Figure: Fiat money relies on the payments to government employees with it and the power to collect it back as taxes on the population. It has been a US policy of borrowing from bankers through Treasury bonds (the method is given in section 1). USA have thus been designed to be in a perpetual state of indebtedness to bond holder bankers. Quantitative Easing is an even more outrageous extension of that monopoly. This posting shows why. 1. Borrowing from the population. We note that the US government regularly issues and has been using its own Fiat money. When the government wants to borrow X units of its fiat money from its citizens, it may have to conduct an “auction”. b. It may offer to all of its people to give the government any each of their spare $1000 now to receive a (transferable, resellable) certificate to receive $30 every year and hold it until the end of 10th year to get $30 plus the principal of $1000. Too many of its citizens may accept the offer and the total amount of their money may far exceed the requirement of the government. If that is the case, it may next say No, not $30/year anymore, but $20/year. The amount may goes up again until the acceptance has only about X units, the amount it requires. This is the idea of Treasury Notes, Treasury Bonds. Anti-corruption requires that the bidding process be public and transparent. If the final auction price is $30/year of for $1000 of money then the Treasury Bond rate is 30/1000 or 3.0% per annum. The transferable T-Bonds is then available for resale on the financial market. Initially it is worth $1000 then it may drift up or down. Its value at any time is the worth of all money collected from the remaining time compared to prevailing market. A $1000 bond entitled to $30/year has 9 years left. The economy now has 0.01% interest and this rate will extend past the redemption date. (To be exact, the inflation discounted values should be used. Inflation has been assumed to be zero in the calculation). It has been US government practice to always keep the US in debt with Treasury bonds. There has been no plan to ever free the US from debts. It would be alright if the debts are spread to ordinary US citizen. In reality, the debts are concentrated to only a handful of billionaires. The indebtedness to a handful of them may threaten the democracy of the US and these people have now extended their grip into another scheme for skimming national wealth called Quantitative Easing. Quantitative Easing is an even more outrageous extension of the manipulations on Treasury bonds. When the government wants to have more money circulated in the economy of the population, it can buy gold from the population so that the population keeps the money and the government keeps the gold for future resale. Beside gold the government can also buy infrastructures or services from the population. The government now buy back the Treasury Bond at a price of nearly $1270 from bankers a bond it has previously sold 1 year ago for $1000. So the government has given away $270. The government lost money for nothing. That why US debt has ballooned up after Quantitative Easing. See reference  for the new level of debt. The injection of money should have been done by government buying gold, infrastructures (including hiring people to build anew or maintain infrastructures) or services from the population. 2. If inflation had been targeted by the government to be 2% (see reference ), buying back a 9 year bond at $1180 is just giving away $180, and bankers will be happy to take that. 3. QE gives bond holders surprised gifts. As long as the bond holders know that the government wants to buy back an enormous amount of X dollars of immatured bonds, they will hold tight to their bonds until the auctioning bid reaches its present value discounted by inflation. Any reasonable bond holder would do that. After that, the absurdity of zero interest rate is born. 4. Social effects of absurd zero interest rate. With zero interest rate, pension (or superannuation) funds will not have incomes on any future investments in bonds. They will have to keep cash, gold or plunge into the share markets. This shows that even well designed pension funds will face more risks from the share markets. Bond holders (including some pension funds) got a surprise gift of free money through QE by the government, but the gift will not drip down to pension funds and individuals on fixed term deposit with the banks. Having PRIVATE Federal Reserve Banks, practicing obfuscated Quantitative Easing all look like plans to defraud American people of their wealth and permanently enslave them with ever increasing debts to bankers.
. Quantitative Easing, Investopedia, http://www.investopedia.com/terms/q/quantitative-easing.asp, accessed 1st Mar 2017.
. Quantitative easing, Wikipedia, https://en.wikipedia.org/wiki/Quantitative_easing, updated on 02 March 2017, accessed 03 Mar 2017.
. Why does the Federal Reserve aim for 2 percent inflation over time?, Board of Governors of the Federal Reserve System, https://www.federalreserve.gov/faqs/economy_14400.htm, updated January 26, 2015, accessed 03 Mar 2017.
. sdbast, Ripped-off Britons: Osborne finally admits BofE’s QE payouts gifted min £600bn to the wealthy, worth half the national debt: https://t.co/WNp9Kw7XVb, sdbast.wordpress.com, https://sdbast.wordpress.com/2016/12/18/ripped-off-britons-osborne-finally-admits-bofes-qe-payouts-gifted-min-600bn-to-the-wealthy-worth-half-the-national-debt-httpst-cownp9kw7xvb/, Dec 18, 2016.
. peoples trust toronto, Bank Of Japan Said To Start Preparing For Losses On Its “Huge” Debt Holdings Once QE Ends, https://peoplestrusttoronto.wordpress.com/2016/05/20/bank-of-japan-said-to-start-preparing-for-losses-on-its-huge-debt-holdings-once-qe-ends/, 2016 May 20.
. Markets upended because Fed has ‘no clue’ how it will end bond buying: IMF, Reuter , https://www.reuters.com/article/uk-us-economy-imf-idUKBRE95O0P720130625, June 25, 2013. A satirical guide to signs of an impending crash for small investors, Your fiat money (Part 2), Your fiat money, Bankers given outrageous incomes by their boards, Signs pointing to an impending crash for small investors, Bankers earn more than interest margin on secured loans, Can most pension funds last?